Rivercrest CPA's is the result of a merged CPA firm. A few CPAs joined forces to offer more services under a new name to their clients. They had a nice looking logo but barely any online presence. It was tough for people to find them online. Rinard Media started the process by meeting with the client to discuss their goals. One thing we talked about was how most CPA sites are template driven websites and that Rivercrest CPAs didn't want their site to look cookie-cutter. Ashley was the designer on this project and she really took the design to the next level. 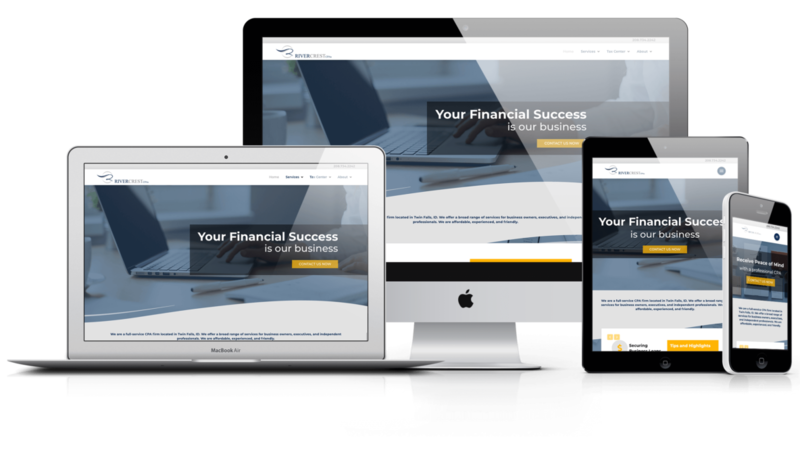 We took a modern and professional approach to this design so customers can get a good sense of what they will feel when working with Rivercrest CPAs. The website turned out beautifully and is fully responsive across all devices. Rivercrest CPAs was a nonexistent brand online and became a powerful brand with a vision for the future.